Compared to their peers, are middle children bossy? In spite of the fact that they tend to get less attention than their siblings, studies indicate that they may be - but only as much as any other child in a family. The psychological theory of birth order characteristics is both straightforward and controversial. Originating in the 1920s with Austrian psychologist Dr. Alfred Adler, the hypothesis essentially states that the personality of a child is greatly influenced by their "niche" in the order of siblings. The firstborn child in a family receives the most attention until the second child is born, at which point they are often expected to take on more responsibility. According to birth order theory, this creates a sense of drive and a need for achievement in the eldest child. The youngest child receives the most attention, and is also usually not asked to take on many responsibilities. According to the theory, this makes them somewhat irresponsible and even hedonistic. 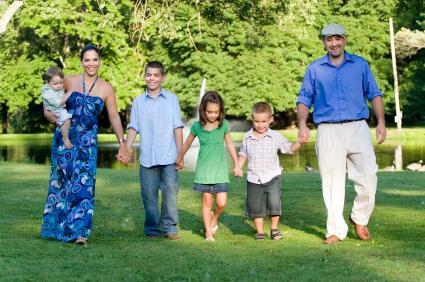 If the family has another child, the youngest becomes the middle child. Suddenly he or she loses the focus of the parents' attention, but at the same time the child isn't treated the same as the older child. According to the theory, this can cause a kind of identity crisis in the middle child, who becomes quieter, more of a peacemaker between siblings. According to birth order middle children are the least likely to be bossy or "type-A" personalities. "Listeners, Negotiators and People Pleasers"
Dr. Kevin Leman, author of The Birth Order Book, describes middle children as "listeners, negotiators and people pleasers." He agrees with Adler's theory that a childhood of navigating between older and younger kids turns them into born mediators, able to get along with anyone. However, the changing of their identity from youngest to middle child and a lack of attention can also cause middle children to be less secure in their families. They may seem more disconnected or mysterious, according to Dr. Leman, or even less decisive than their responsible older siblings. This is where birth order theory starts to run into some bumps, with the evidence of successful middle children such as Steve Jobs, Bill Gates, and Donald Trump. John F. Kennedy was a middle child, and while he was known for his appeal and ability to mediate, he certainly was not known for being indecisive. Are Middle Children Bossy? Why Not? Not all psychologists and social scientists agree with birth order theory, especially in a modern context. Judith Rich Harris, author of The Nurture Assumption, is one of the most vocal opponents of the whole idea. In her books, as well as on websites such as Edge.org and in interviews, she debates many points of contention with the Birth Order theorists such as Dr. Frank Sulloway. "Only children," she points out, have personalities no different than those of children with siblings. This means that middle children might be bossy, might be overachievers, might be withdrawn or argumentative, or might be party animals. Like any child, the behavior of middle children may, in large part, be most affected by the way they are nurtured in the home, rather than what order they were born. Other scientists, such as Ernst and Angst in 1983, have found other serious flaws in the birth order theory. After examining the research done by Sulloway and others, they did their own study with over six thousand subjects. They found no correlation at all between birth order and any personality characteristics such as being bossy, being shy, or achieving success. In other words, middle children might boss around their siblings, but only as much as any child might. What they did find was that if people knew the birth order of a child they were likely to project those characteristics onto the child, an example of "confirmation bias." There are also those who fall somewhere in between these views. Professor Nigel Nicholson, author of Family Wars, suggests that the reality comes somewhere in between. In an interview with the Independent, he said that while birth order might have a little significance, it has a "negligible impact on measurable personality." He views children as being shaped more by the "scripts" they create for themselves as strategies to get through growing up. With so many differing opinions, the answer to the question "are middle children bossy?" is not cut and dried. While the older and younger siblings may play a part in it, the reality is likely that you need to take the entire environment into account to explain the personality of any child, middle or otherwise.